Visual MODFLOW Flex supports the following file types for well data. •Select Wells from the Data Type drop down list. 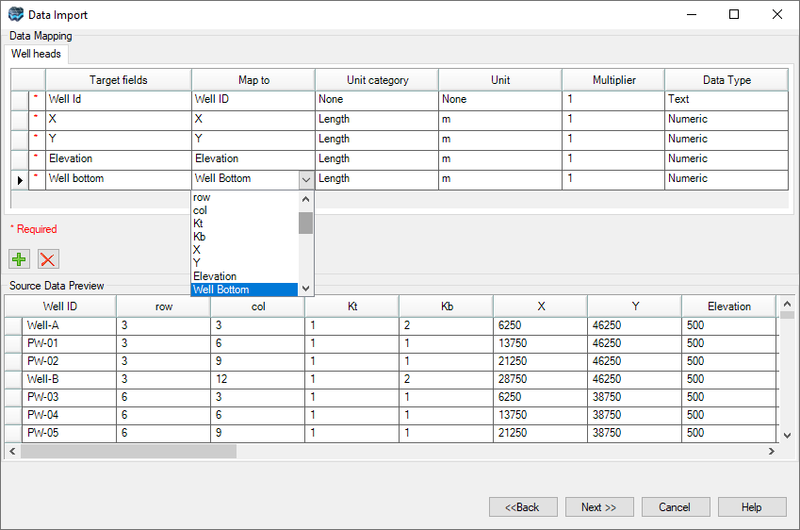 •The next step allows you to preview the source data before importing, and choose a subset of the source data, e.g., a worksheet of an excel file. Select which Excel worksheet to import from the Select Worksheet drop-down list. Also, you can choose which row to import from using the From Row text field. In the Select the type of wells to import frame, choose between Vertical and Deviated (Horizontal). Next, specify how the vertical data is expressed in the source file. If the data is expressed with respect to a vertical reference datum, e.g., above mean sea level, then select Elevation. If the vertical data is expressed as a depth, e.g., distance from ground to the bottom of the well, then select Measured Depth. Time Options: Time-varying data can be imported in Absolute (eg. calendar date 5/10/2015) or in Relative times (1 day, 30 days, 365 days, etc) where the value is relative to the start time defined in the Modeling Objectives). Screen ID Location: Import the screen locations for each well. Select the Pumping Schedule check box to also import related pumping schedules for each screen. This data could be used later to define pumping well boundary conditions. Observation Points: Import observation points for each well. Select either Observed heads, Observed Concentrations, or both. Well tops: Import the elevation (or measured depth) of points along the well path, where geologic formation (contact points) intersect with the well. This data could be used later to generate surface and horizon layers. 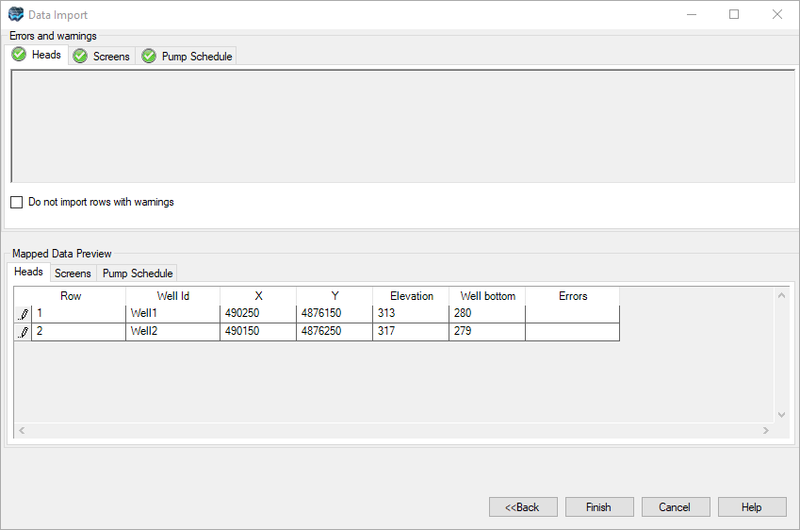 Once you have selected which well data to import, click the [Next] button to proceed to the data mapping . •Well ID must be a unique value in the source data. If not, any rows containing duplicate Well IDs will not be imported. For each well in the source data, the Screen ID must be unique. Also, screens should not overlap within a single well. These requirements will be validated in the final step of the well import process. •Pumping Start Date, in MM/DD/YYYY HH:MM:SS format, time is optional. •Pumping End Date, in MM/DD/YYYY HH:MM:SS format, time is optional. If time is not included in the source data (just the date), Visual MODFLOW Flex will automatically set the time to 12:00:00 pm. Currently, Pumping Schedules can only be imported using absolute time. Please ensure that the date and time values in your source data are expressed in absolute time (MM/DD/YYYY HH:MM:SS) and not relative time (0-10 days, 10-20 days, etc..). The Obs. Point Z (Elevation) will determine in which model layer (cell) the observed head/concentration was measured; at the time when you view charts, VM Flex will find the calculated head value from the same cell, and then use this for comparing your observed value to what MODFLOW calculated. The same is true for Transport (MT3D) runs, but in this case it will take concentration from that cell, and compare to what you observed in the field. Top ID, formation name, e.g., Sand1, Sand2, Clay etc. The final step in the Well import process is data validation. Visual MODFLOW Flex will validate the mapped data, and highlights any rows that contain invalid data, e.g., null values, wrong assigned data type, duplicate rows etc. Please see "Data Validation" section for more information on data validation. Click the [Next] button to import the data. 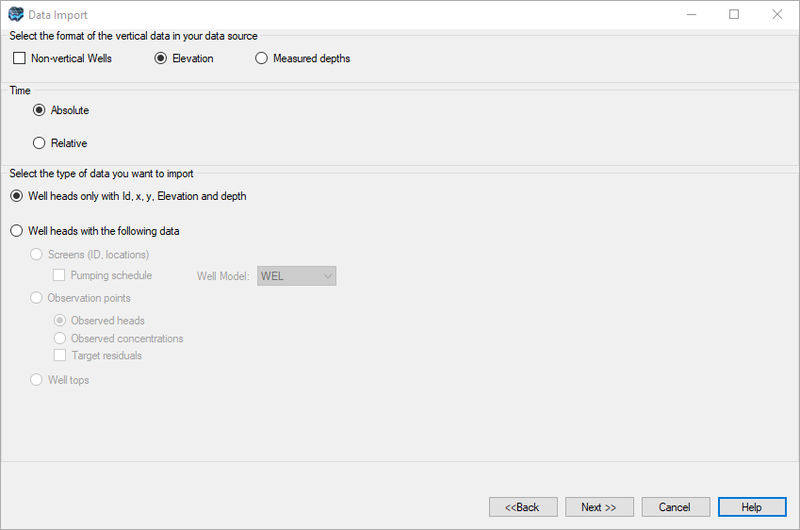 Once imported, a Wells data object will be added in the Data Explorer.